Our Future Rooted in Our Past: Does Anybody Really Know What Time It Is? Today was the first day of Daylight Saving Time....I am exhausted. I do not like loosing an hour of my day and was discussing this with my son last night as I reminded him of the time change. I was sitting at my computer while we started visiting about why Daylight Saving Time happens in the world, so I decided to google the information. When you get right down to it, we are not really "saving" time, but we are just adjusting the clock so that we have more daylight hours when the majority of the populations are awake. We continued to discuss this when the thought came to me regarding how this time change would affect our genealogical research. I am sure that you have heard of the challenges of determining the birth dates around the time of the Julian and Gregorian calendar changes which varied according to the various countries adopting the change. Similarly, as I was reading about the Daylight Saving Time change this also brought up another interesting challenge that all genealogist/family historians deal with on a year to year basis when it comes to birth and death dates. As I was researching on the site, they addressed the different challenges of Daylight Saving Time where it can reverse the birth order of twins. The site stated the following example: "While twins born at 11:55 p.m. and 12:05 a.m. may have different birthdays, Daylight Saving Time can change birth order on paper, anyway. During the time change in the fall, one baby could be born at 1:55 a.m. and the sibling born ten minutes later, at 1:05 a.m. In the spring, there is a gap when no babies are born at all from 2:00 a.m. to 3:00 a.m." These facts could raise questions but for the most part the chances of these occurrences are probably lower than most. I found the thought intriguing and realized that if you are having trouble locating a birth or death certificate of an ancestor born around the time change of Daylight Saving Time would be simple to fix by looking at the day prior or the day after you thought the birth/death occurred. You also need to consider the country that the person's birth/death occurred as different countries and localities start the Daylight Saving Time changes at different times of the year. Most genealogists and family historians consider various dates/years for a birth or death so this most likely will not be a problem for most, but it was an interesting thought that I had while visiting with my son. 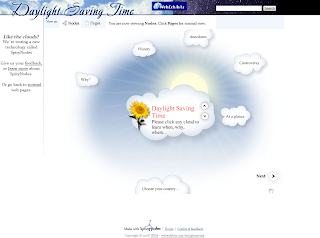 If you would like to read more about the history of Daylight Saving Time, click here. Have fun!